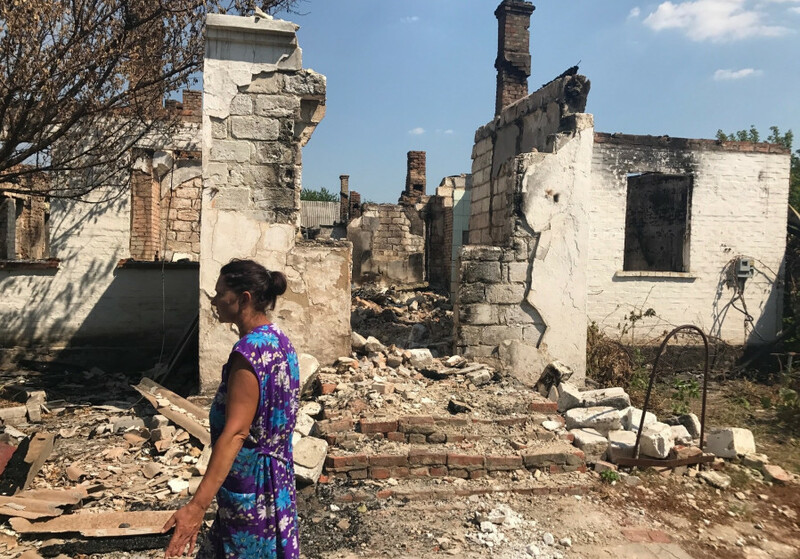 KRASNAHOROVKA, Ukraine -- Svetlana Voilova stands by the gate to what was once her apartment in a long brick house in Eastern Ukraine. Svetlana Voilova in front of her destroyed apartment in Krasnahorovka. In late July 2017, it was hit by incendiary artillery shells and destroyed. Now all that remains of what were once nine apartments are the chimneys and shell of the home. One man wounded in the shelling died in a hospital and another is still recovering. Voilova’s home is on the Ukrainian government-run side of the cease-fire line established in February 2015, in an agreement between Russia, Ukraine and two separatist areas known as the Donetsk People’s Republic and Luhansk People’s Republic. The 13-point plan was supposed to include a cease-fire and removal of heavy weapons from the line of contact between Ukrainian and separatist forces. It is monitored by the Organization for Security and Co-operation in Europe, or OSCE. The conflict here has implications not only for relations between Russia and its neighbors, but also for NATO, European Union states and the United States, all of which have played a role in the conflict. The US, for instance, is reportedly in discussions to supply Ukraine with anti-tank weapons. Despite the cease-fire, Ukrainian military personnel and civilians say that artillery shells regularly hit civilian buildings. “From the 3rd of May, we had one wing of a school damaged and also the hospital, and in May, six apartments [were hit by shelling],” says a military spokesman for the Ukrainian 92nd Brigade stationed in Krasnohorovka. In all, he details 41 buildings hit in shelling in this one town in recent months. “There is not one house here without damage,” says Lena Meslitskaya, whose home is down the street from Voilova’s burned apartment. These small brick homes surrounded by little vegetable gardens were built in the 1950s, when Stalin was in power. Meslitskaya has had to brick up and reinforce the windows from being shattered in the shelling. For her mother, Maria, the war brings back memories of the Second World War. Born in 1928, Maria says she helped pick up the bodies of fallen soldiers after the battle of Kursk, the largest tank battle in history, which was fought in 1943. Driving through towns that border the cease-fire line, evidence of the ongoing war is everywhere. Roofs are caved in from shells and some apartments that face toward Donetsk – a city in separatist hands – are deserted and windows shattered. During the day the fighting is quiet, but at night gunfire is common. Heavier weapons, such as 120 mm. mortars, are also used, say Ukrainian officials. The OSCE says that both sides have committed violations over the years. Before the war, Alina Kosse was director of a district center for children’s art. She says her town of Marinka was well-known in the area for producing talented youth, including ensembles that performed throughout Eastern Europe. After the conflict began in 2014, many people left their homes and the arts center was closed for a time. “Every day is Russian roulette,” she says, showing bullets that have landed on her home, 2 km. from the cease-fire line. “I receive shrapnel in my roof, and this is considered a ‘safe’ area,” she says. With the presence of the army in the town for three years, Kosse has tried to integrate the community with the soldiers. This area of Ukraine is Russian-speaking and when the war broke out some of these communities were briefly controlled by separatists, which means locals are not always reconciled with the Ukrainian government. Kosse, whose family came from Greece to this region in the 18th century, argues that people should not betray their country. Convincing locals to support the army is a central mission along the cease-fire line. That involves working closely with civilians. They also work to remove land mines from local farms, he says. All along the cease-fire line the burden on civilian life is difficult. People whose lives were centered on work across the line have shifted careers. Even though they can cross back and forth at several points along hundreds of kilometers of front line, the checkpoints and security checks take hours, locals say. But many of the older people have lived through times of privation before under the Soviets. At a local lake a few kilometers from the conflict, hundreds of youth in skimpy bathing suits splash in the war. Like in so many places in the world, life still goes on in the shadow of war.